Andy Dalziel of the Mid-Yorks CID has witnessed a murder, but it was though dark glass and he was being sick at the time. Now he finds the case shrouded in uncertainty and a string of contradictory statements. And who is his anonymous letter writer threatening suicide? Meanwhile Dalziel's colleague, Peter Pascoe, has returned from a long convalescence uncertain about his job, his marriage, or his motivations whilst having to act as a moderator to the strong-willed Dalziel. In the background and, occasionally, the foreground, are the York Mystery Plays with their Director, Eileen Chung, who uses and abuses her vast range of talents to get the cast, site, and show she wants. But mysteries linger long after the performances, mysteries with no solution. sound quality is abysmal, muffled with occasional speed changes as well. Adjustment of treble (increase) and bass (decrease) and listening for a few hours has made it tolerable. I normally love the Dalziel and Pascoe books and have many read by Colin Buchanan and Shane Dooley. I am sorry to say that this the reader of this one, I find virtually impossible to listen to, the sound is so muffled. It's a great story, the usual complex of delights but I will be seeking out another version. I have to agree with the other reviews, I can't listen to this book. The sound quality is poor and Brian Glover, altho a great actor, reads it very badly. Please get Colin Buchanan to redo it! Very poor sound quality, very muffled and barely distinct. (I've downloaded over a hundred audible.com books & have never had this complaint.) Too hard to listen to...too bad, because a Hill novel never disappoints. Performance made it very difficult to follow storyline. The transitions from person to person, time and locations, etc. were so unclear that I had to keep backing up in order to make sense of the story. What was one of the most memorable moments of Bones and Silence? Reciting lines from the "play"
Would you be willing to try another one of Brian Glover’s performances? Sure, maybe it is just this book. I have others that he narrated and enjoyed. Do you think Bones and Silence needs a follow-up book? Why or why not? Always ready for another from Reginald Hill. Story was confusing. Narration poor....almost impossible to tell when another character is speaking or when a scene changes. The only character well portrayed is Dalziel. 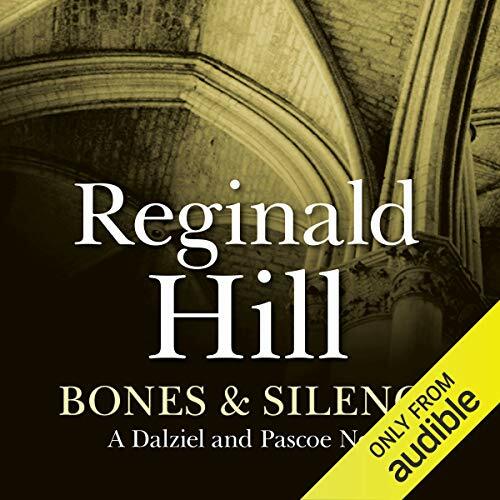 I loved the Dalziel and Pasco series on TV, but this was impossible and not up to Reginald Hill's talents. I will see about returning it. What about Brian Glover’s performance did you like? It's hard to believe that there is only one narrator. The voices of the characters seem to reveal such different personalities. Hill weaves several plots together with such skill that they never seem to intrude upon each other--instead, they resonate. This is particularly true of the last scene when all the pieces seem to fall into place so suddenly and so shockingly and you see the main characters even more clearly. What did you like best about Bones and Silence? What did you like least? The decibel range of the performance is outrageous, from whispers to outright shouting, made it impossible to enjoy. Add to it the exaggerated (York?) accents made it mostly incomprehensible. First time I've given up on the performer. Need to hear it clearly to judge. Who would you have cast as narrator instead of Brian Glover? Anybody. Never had to complain before.